Finally getting near the end here. And my guess is that I'll finish it before Congress raises the debt ceiling, if in fact it decides that's a better option than the full blown recession that seems heading our way. Oddly enough for all the transmogrifications this print has gone through it's starting to look much as I'd planned. The vague idea is taking shape. I still plan to add a bright orange to just the throat and then replace much of the black in the foliage with green. Whether it will be a tinted green, as i'd originally planned, a medium leaf green, or a darker gray/green only time and experimentation will tell. I do want to add that last fall I wrote a post on what I expected the November elections would bring: they would have the impact, and not a good one, of a mighty oak falling in the forest and destroying all that surrounds it. This was based on seeing just such a thing at Carpenter's Woods. That seems to be exactly what we've gotten. You get what you elect. Where Did This Patience Come From? I've never been a patient person. But as with most people age and experience has shown me that sometimes it pays to at least try to be patient. In art it's easy to feel like I want the results now. I want that extremely vague idea in the back of my head to immediately appear as a finished masterpiece as soon as I begin a new work. I know some people like to work more slowly and almost meditatively. There's something appealing in the process of working itself, not just in the finished result. I understand the second camp but I'm more with the impatient artists I'd say. Still I've learned that good work generally doesn't work that way. It is like true conversation. You have to look and listen to what the work is telling you. I know this might sound hopelessly mystical and nonsensical to non-artists. But really it's no different that a major league shortstop fielding a hard hit ball in an unfamiliar ballpark. The shortstop doesn't just methodically catch the ball, knowing exactly where it will go once it leaves the batter's bat. All sorts of odd things happen along the way. You need to stay alert. The same is true in art. You need to stay alert and sometimes you have to take a lengthy road to get to your goal. 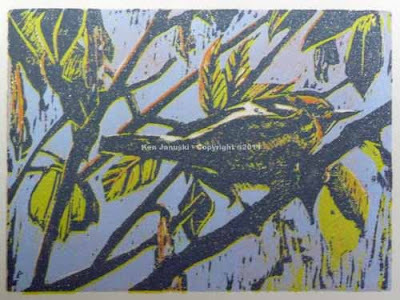 That's the case with reduction linocuts. 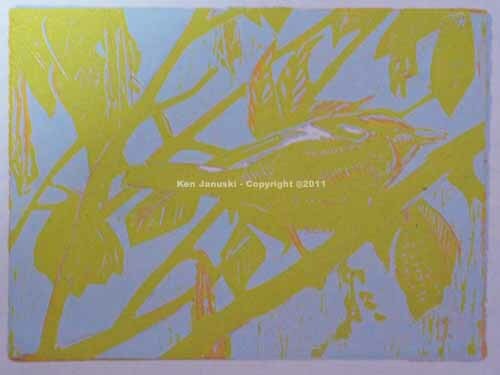 When I began this print I anticipated six colors, a light orange, bright orange, yellow-green, blue, black and green. A light gray and dark burgundy were also possible for small accents. As you can imagine printing at least six colors means a lot more work. So my thought is: if I'm going to make such a complex print I might as well make a large edition, assuming of course that the end result will be successful. So that adds more work. For this print I've done about 30 proofs and 18 actual prints. Each proof and print must be properly registered so that the various colors match up. For instance I don't want the black of the limb mistakenly appearing on the white of the birds breast because of sloppy registration. So you can probably see this is time consuming. It comes as a great surprise to me, an impatient person, that I have the patience to go along with this lengthy process. I printed the fourth color yesterday, as seen in the photo above. I'd have to say this was sloppy thinking on my part. I was looking for a grayish white that would show the whitish breast in shadow, but I also wanted a gray for some of the more distant limbs. Instead I got a very, dark gray, far darker than I'd anticipated. BUT there was something I liked about the strong contrast it created with the other colors. Today though I realized that it was just too untrue to the breast of the Blackburnian warbler, even in the darkest shadow. So today I mixed up a largely transparent white. I inked just the breast and printed a proof. I wasn't thrilled with that so I inked the entire linoleum block, knowing that I could always print over areas that I didn't want to be white in the finished print. That looked far worse. So finally I went with the white in just one area, as shown at top. There's one problem with that. It looks a bit ugly. Most of this is due, I think, to the fact that it is a loosely defined area. I know however that I'm planning to print the black breast streaking of the bird in that area. My hope, is that once the black is printed the breast will also look crisp. But now I've done five colors and I foresee at least three more: black, bright orange and some sort of green. I'll probably determine that once I print the black. This means at least three more days work. Where in the world did I get the sort of patience that allows me to spend over a week on a print? I'm not really sure. My guess is that it's a matter of hope springing eternal. Somewhere in the back of my mind I think the results will be worth the work. 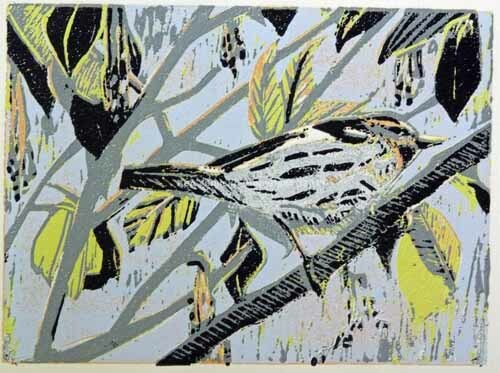 If you wonder why, though, I don't do more reduction linocuts, I think you now have your answer. Like much of the US we're going through some triple digit weather. Since we don't have air conditioning, and don't really want it, anywhere except the bedroom it tends to get a bit hot on days that are over 100 degrees Fahrenheit. It's based on a watercolor sketch I showed back in May or so of a Blackburnian I'd seeb at Magee Marsh in early May. 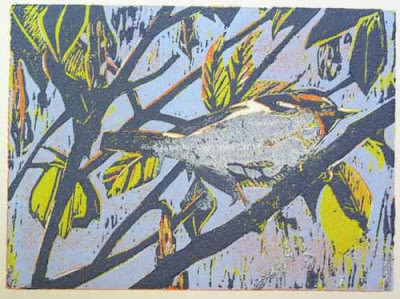 Reduction prints are somewhat like a leap of faith. The 'faith' is in your ability to make the whole thing work. Maybe some people can clearly plan out the 5-10 colors that might be used in a reduction cut. But not me, and not most people I'd guess. I come up with a vague plan but then I base most of my further decisions on the proofs that I pull as I go along. This proof has gone through three colors plus the white of the paper. You can still see some of the orange that was the first color. That was followed by the light blue, then the light yellow. I still plan on 3-5 more colors and the print might dictate still more. As I go along my faith is in my ability to react to what happens and still come up with something I'm happy with. I'd guess another 3-5 days on this print, perhaps more. 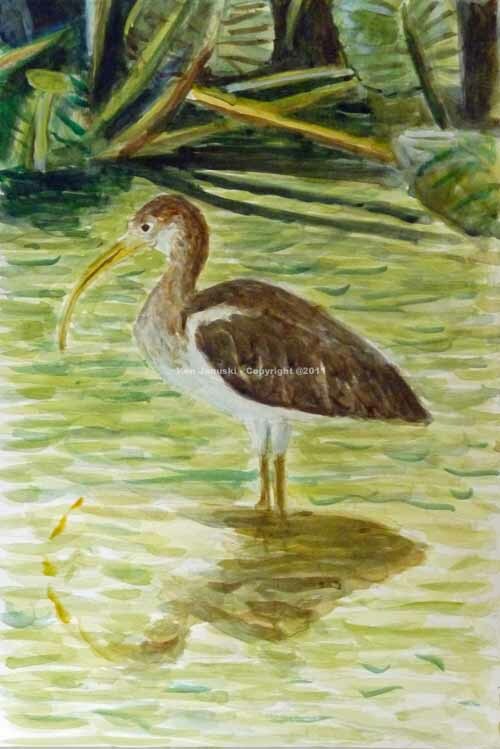 Though it seemed accurate the neck on the juvenile white ibis that I showed a week or so ago seemed a bit thick. Some recent photos by others of the same bird at John Heinz NWR in Philadelphia that I happened upon on the web also showed how the neck can seem very thick when held a certain way. But the neck can also look slimmer. I also felt like that watercolor didn't adequately show the variation in neck color. So above is a second watercolor of same bird, this time looking slimmer and doing a better job with the neck coloration I think. When I first moved to Philadelphia I spent the bulk of my time making art. Making a living, paying bills, etc. was secondary. Not that I didn't pay my bills. Just that I didn't make a steady job whose primary purpose would really be to pay the bills become my top priority. At that time I had a studio next to the not-yet-renovated Ben Franklin Hotel on Chestnut St. in Philadelphia. What time I didn't spend painting and drawing I spent doing the dirty work of trying to get my work shown. To make a long story short I spent a lot of time photographing my work, then manually masking the slides I got back so that the work itself was accentuated, then working up the nerve to walk into what I thought where the most high quality galleries in Phildelphia and asking them to give me a show. I'm not a purist about art, though I suppose I might have started out that way. But I understood fairly early on that you had to SELL work in order to survive, and the main outlet for that was commercial galleries. But after I'd visited most of the galleries I was interested in and having a number of them come to my studio and look at my work I still didn't have the promise of a show. Eventually those aforementioned bills took their toll and it was either ignore them or get a full-time job. So I got a job. That cut into my time but I still made art and tried to get shows. At some point though, as I mention on my web site, I began to doubt that I was going to be able to show in the galleries I wanted to. They continued toward 'ideational' art, where ideas, quite flimsy ideas to my mind, and verbiage replaced visual substance. So much work seemed to need a lot of 'verbal advertising' in order to get any attention. This trend was occuring in the art magazines and museums as well. And the galleries I wasn't that interested in probably wouldn't have shown me either. My style was too different from what they showed. So I basically stopped trying to show in galleries. The only shows I have had in the last 20 years or so were at the Schuylkill Center for Environmental Education where I had two shows of my insect drawings. 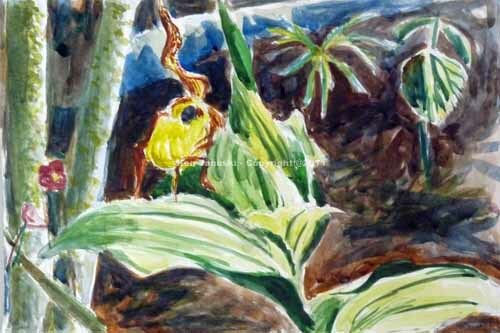 When I changed to naturalistic art five or six years ago I was too new to it to try to find a gallery to show it. AND, there was the internet. I've had at least one site for at least five years, and have slowly added this blog, my primary online store, and have tested out the water at etsy, mainly for my more inexpensive prints. About 10 days ago I read in the local paper about a juried show at a neighborhood art center less than a half mile from where I live. With some trepidation I applied and was accepted. But why go back to galleries after 20 years without them? Well for one thing it involved little effort on my part. It really was just around the corner. For another I've always liked the idea of supporting 'local' businesses, whether food coops, local art centers, community supported agricultural or whatever. So much of the world seems to have lost the values of the neighborhood, though I have to add that I long ago abandoned my home neighborhood in Illinois and have spent a lot of time living in large cities. I'm sure that this skews my perspective a bit. A third reason was that art really needs to be seen to be truly appreciated. That's one reason Albert Barnes didn't want color reproductions of his collection. Reproduction is always lacking but gives a false sense of being accurate. I've always been a big supporter of him and his vision of his art before the local courts dismantled it. In any case there is so much more to art when you see it in person. So all in all I just couldn't pass up the chance to perhaps show at the Manayunk Roxborough Art Center. The photo at top shows two of my recent prints that were accepted, the multi-color reduction linocut of Wood Ducks along the Wissahickon, and the most recent linocut of the Lousiana Waterthrush and Ebony Jewelwing also seen along the Wissahickon. Since so many of the people who go to the gallery should be familiar with the Wissahickon I decided to submit these two prints. Above my wife Jerene looks at part of the exhibit last Saturday. And below a shot of the outside sitting area and fountain. 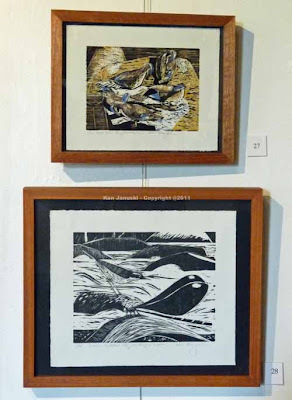 The gallery at the Manayunk Roxborough Art Center is open on weekends from 10 a.m. until 4 p.m. This show runs through July, 31. If you're in the neighborhood please stop by. And be sure to look for those Wissahickon prints. No sooner had I written about migrant birds being gone and the residents now having their neighborhoods back for their own personal use than a southern bird, the White Ibis, was reported at Tinicum, a.k.a. John Heinz NWR. Since it was a beautiful day yseterday, though a bit hot in full sun, I decided to take the 15-mile drive and try to find and sketch it. I don't know if I've ever experienced a more easily found life bird. And during the 60-90 minutes I sketched it the young bird never moved more than 25 feet. Above is one of the better field sketches I tried. The watercolor at top is based on a photo I took, coupled with my memory of the bird. When you spend 60 minutes sketching you do tend to develop solid visual memories. One of those memories is the beautiful streaking on the neck, a combination of ochres, browns and whites, much like a shorebird. Unfortunately many of the photos showed the bird in shadow, so they don't really show the subtle coloring on the neck. This streaking by the way, along with other clues, indicate that this is a juvenile bird. Breeding adults are bright white. Since I'd never seen one before I was looking for a white bird. 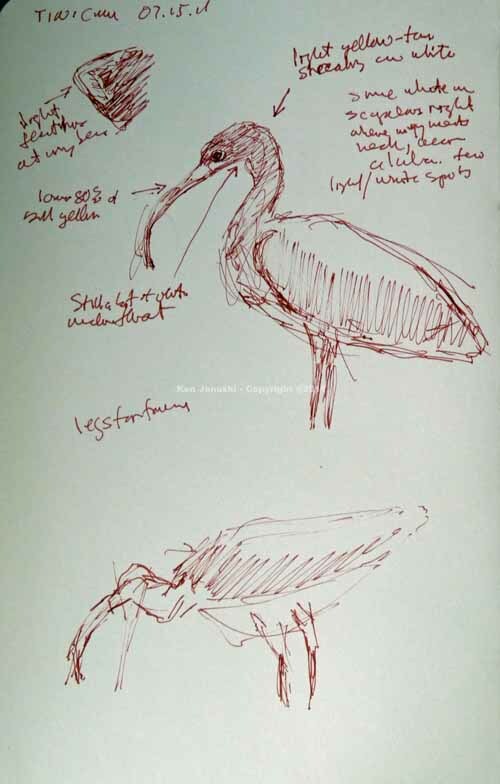 But once you've seen the curved bill of an ibis it's easy to spot one regardless of color. Above are my first sketches. I think they got better as I got more familiar with the birds. Another birder told me that this bird was a post-breeding wanderer. 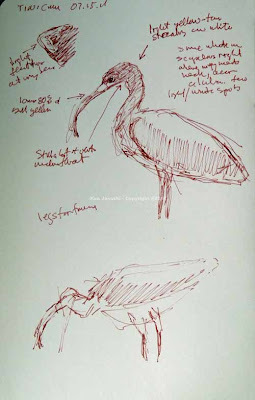 When I checked my guidebooks when I got home they also mentioned that White Ibis are known for this. So this bird is not a northern migrant heading back south. Instead he's more like a youthful explorer. You know youth! So it seems aside from him the breeding birds still have their neightborhood to themselves right? Well not quite. I also saw at least 65 Least Sandpipers at Tinicum. Another birder, who leads walks there, told me that these were males heading back south. I've read about how early fall migration begins. But this is the first time I've ever personally been hit over the head with it. But I can't complain. A lump on the head is well worth the price to see so many beautiful birds, especially when you know their story and their lengthy migration. It just makes the natural world seem all the more amazing. I took photos but had no time to sketch. Hopefully I'll soon get back out to sketch or will try a painting based on the new photos as well as some from Ottawa NWR in May when they were heading north. Anyone who has lived in a tourist town or a touristy section of town, as I once did in San Francisco, knows the odd feeling of your neighborhood not really belonging to you. There are all these strangers there, acting like it is THEIR neighborhood. 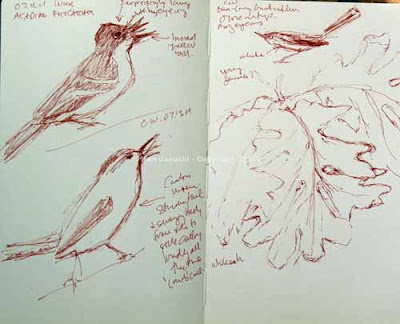 I had to think of that today while briefly birding and sketching at Carpenter's Woods. Most of the migrants have been gone for a month or so, breeding somewhere farther north. And at least at Carpenter's Woods, the tourist birders are gone as well. They can be numerous in late spring but are almost nonexistent now. Whether that makes the breeding birds more normal I don't know. But it seems to. That is the feeling I have as I walk through the local places that I bird. 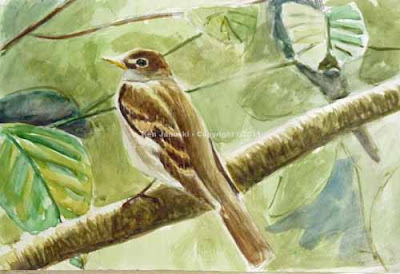 For instance the Acadian Flycatcher, shown in a new watercolor sketch above, sometimes seems like the most numerous bird at the Wissahickon. They're still hard to see as they tend to be at least 15 feet up, fairly well hidden in dense foliage. But I generally get a glimpse of one or two on each walk. That's one at top left in the field sketches above. It's not really all that successful and doesn't look much different than the many other sketches I've done of it this summer. So while this recent viewing was fresh in my mind I decided to do a watercolor sketch from some older photos I'd taken. My thought was that doing something more developed might coalesce all the tidbits of knowledge I had picked up in all my recent sightings. Hopefully it will. The only other solution I can think of is to just camp out in their vicinity and keep sketching each time they make their 15 second appearance until I have them down. The tourist season analogy hit me today as a Carolina Wren seemed to scold me for a 5-10 minutes. It took me awhile to realize he was right in front of me, only six feet away, rather than 12-15. The sketch above tries to capture the way he stood with legs splayed, stretched tall as could be, head almost straight in the air, calling out loudly. What was oddest though was how he would switch from facing right to facing left as he did this. Each time he made this quick movement he struck a new dramatic pose. Like the Acadian I'm not happy with the sketch. I also took a couple photos. I might trying to use this sketch and the photos to try to capture this striking event in watercolor. Regardless of the sketch though the actual experience got me to thinking that I was now in the real world of birds. Perhaps he was warning off a mate on eggs, or with young. In either case it seemed like I'd intruded in the daily life of my local birds. That's not quite as exciting as glimpsing the brilliant neo-tropical migrants on their short trips through. But it is very satisfying and not at all to be missed. There's nothing like knowing the natural order of the place in which you live. Oh yes. A field sketch of some low-hanging White Oak leaves. I'm determined to spend more time on this. No more leaf torture remember? As I drew and painted this yellow lady's slipper the last few days there was something that bothered me. I'd never done any sketches of the plant when I saw it. This watercolor is based on some photos I took. But there were many plants all in same photo. How could I tell I was drawing just the part of one plant? I know enough about plants, just my visual impression of them if nothing else, to have been somewhat worried about the five petals. Often parts are paired in flowers, though certainly not always. As I read the quote above this morning I got even more scared that I might be wrong in my portrayal. To confirm it I saw that a few pages further on in How to Draw Plants was an illustration of a Lady's Slipper with just four petals. So then I checked Lawrence Newcomb's Newcomb's Wildflower Guide. Same thing. I'd made a mistake. 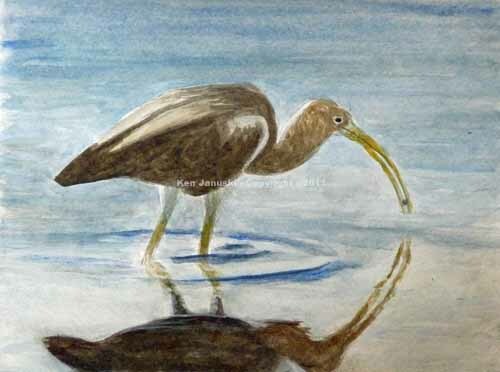 I learned early on in my bird painting how absolutely confusing photos were, even ones I'd taken myself. Often there was a situation just like this where the photo showed something that looked like a part of the bird. But was it really? I didn't know enough about the structure of birds to say for sure. It was a similar uncertainty about flowers that was in the back of my mind about the Lady's Slipper. I should have pursued this further before starting the painting. For me art is always more important than accuracy. Keith West's book is aimed at people who want to do botanical illustration and exactitude and faithfulness to what is seen is stressed. I have no argument with this. It's just not my way. On the other hand I don't want to turn some viewers away from my artistically-focused work on their first glance because something is so obviously wrong. So I try to get things right but just not be limited by them. In this case though I just couldn't leave that aberrant petal on right of stem. It's been rubbed out and replaced by white gouache. I don't know what it says about me or my sense of history that everytime I read something that some historical figure said that rings true to me I'm shocked. As much as I respect history, the great classics, the 'examined life', etc., I'm always a bit shocked when I read something from years or often centuries ago that rings absolutely true today. And it's always a pleasant experience, as though confirming that yes the world does make sense. Collinson wrote in one letter..."and don't escape" the lady's slipper orchid, his favourite plant. A yellow one already flourished in his garden at Peckham, but he wanted a variety because the sculptural blossom "makes my mouth Water"
The line about the sculptural blossom of the Lady's Slipper making Collinson's mouth water really hit home. There is something that just begs to be painted, or perhaps sculpted in Yellow Ladies Slippers or pink Moccasin Flowers. Every time I see them, which isn't often and I think only in Shenandoah National Park I'm stunned by them. But reading this same reaction from 300 years ago was equally stunning, probably like discovering that your parents were once young do and thought and acted much like you. Ever since I read this passage a week or so ago I've had it in the back of my mind to comment on it and the book 'The Brother Gardeners' in this blog. I think what may have pushed me over the edge and made me take up some plant subjects was this failed watercolor of a Tri-colored Heron. It's based on some photos I took at Metzger Marsh in Ohio last May. In marshy areas there are often reeds just about everywhere. 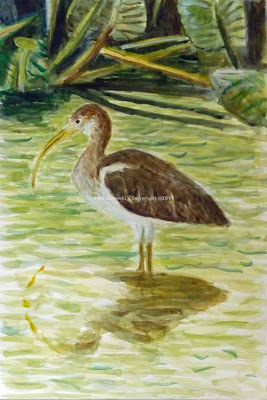 So if you paint a bird in the marshes you'll most often have to deal with reeds in one way or another. I think the reed problem is particularly difficult in watercolor. The reason is that reeds, or at least the parts of them in sun, are pretty bright, often the brightest and lightest part of the picture. 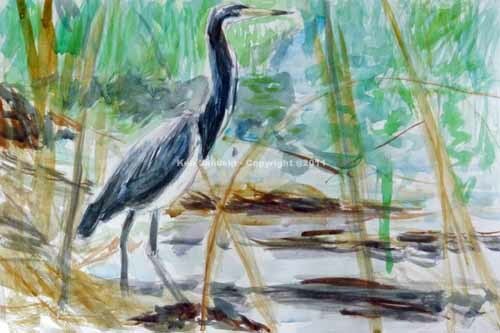 They often overlap the darker primary subject, in this case the heron. In oil you can go light over dark. So it would be possible to paint the darker subject first then paint over it with lighter paints where the reeds cross the main subject. That just won't work with watercolor. You can't work light over dark. And yet if you draw in all of the reeds, something too finicky for my tastes, thinking that you'll use light colors there after you've painted in the darker subject you still have a problem. Unless you paint very carefully, probably with a small brush, it's hard to paint in the main subject in the little sections between the reeds. All sense of a fluid wash disappears. You get patchwork painting. I'm sure some people can do this and others use some sort of masking to protect the light areas while painting in the dark areas. But I've never been able to picture myself doing this. It also seems too finicky for me. So what's left? I keep thinking that I can somehow abstract the reeds and put them on after the main subject, perhaps leaving just a few blank areas on the heron where I'll put the abstracted reeds. That philosophy applied on this painting ended up with me just abandoning the painting! But it did make me think I just need to learn to paint vegetation better. I may need to go through some painful times trying to do some fairly accurate paintings of flowers, vegetation, trees. 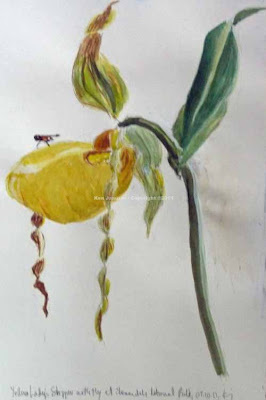 Between this experience and the Collinson quote I decided it was time to paint a Yellow Lady's Slipper. Above is my first attempt. Well as you can see I got so involved with the leaves of the orchid that you can barely make out the orchid. I tried to beat this painting into submission but eventually had to abandon it as well. When I was done I told myself that I just needed to try some more realistic versions of the orchid, and maybe other plants, where they were the undisputed focus of the painting. That is the painting at top of blog. Yesterday it looked so dead I thought I'd also need to abandon it. But more work today got me to the point of half liking it. I'm not sure how much I learned. Most of the vegetation I'll see while birding won't be Lady's Slippers. But it is a start and it forced me to pull out my old photographs and take a look. Finally I'd like to recommend 'The Brother Gardeners'. Given all the petty nonsense that passes for news today, and I'm particularly thinking of one political party when I say that, it's nice to read that Americans, and the British, once had far nobler goals and interests. I've not read Andrea Wulf's new book, 'Founding Gardeners', but I did see her give a talk on it. It was hard to fathom a time when polticians, American politicians no less, were as interested in their gardens as in anything else. How often have you heard politicians discuss gardening over the last 10 years. We seem to have become a greatly diminished country, one in which whatever party or pseudo-party that can sink the lowest seems to win. Maybe all members of congress should be forced to work their own garden plots out on the White House lawn one hour a day. There's a pleasant thought about re-grounding politics and ought to be effective in stamping out some of the nonsense that is currently wafting about. Nature sometimes surprises you. That I think is one of the virtues of taking the time, or maybe having the luxury of the time, to pay attention to it. Yesterday we took a three hour walk along the Manayunk Canal which borders the Schuylkill River not far from where we live. It was almost exactly a year ago that I was shocked to find an immature Yellow-crowned Night Heron there. It's hard enough to find mature Yellow-crowned Night Herons in Philadelphia, let alone immature ones. Was it the child of local Yellow-crowneds? Was it a wayward youngster from elsewhere? I don't know and yesterday's walk didn't turn up another. But we did see at least one Great Blue Heron with his mouth wide open, tongue sticking out and cheeks moving in and out very quickly. In other words it was panting. I wouldn't be surprised to see this on a day in the 90s. But it was only about 80 when we saw this numerous times. I assume it was the same heron at various parts of the canal but it's hard to say for sure. In any case it was striking and led to some further investigation when I got home. This behavior I guess is not all that uncommon in herons. It just seemed odd given the temperatures. At one point he was high atop a 10-12 foot shrub. I did a sketch and also took some photos. The small watercolor above is based on both. The photo turned out a bit darker than the actual watercolor. A few days ago I was walking along the Wissahickon hoping to find at least one of the two Louisiana Waterthrushes that I'd seen in mid-June. No such luck. But I did get some good looks at a couple of Northern Rough-winged Swallows. 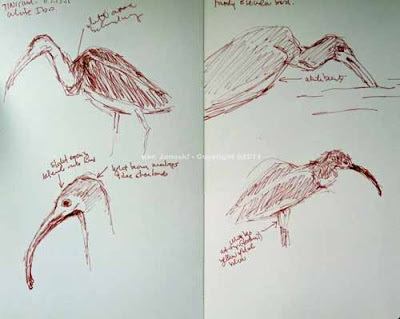 I did field sketches of them and also took some photos. 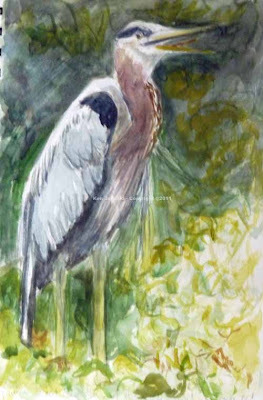 Since I've seen so many, especially immature ones, and done field sketches of them I wanted to do a watercolor sketch. I'd also taken some photos and looked at them as well. I was quite surprised to find one immature with his mouth wide open. Was he yawning, begging as young birds often do, about to snap his mouth shut on a flying insect? I don't know. The photo also indicated that the nictitating membrane was partially covering the eye. This presented a problem. Should I paint something I'd never actually noticed when I looked at the bird with my naked eye? Because I need practice portraying birds with their bills open I decided to do so. There is a huge gape in most birds, much bigger than you'd expect by just looking at the bill. 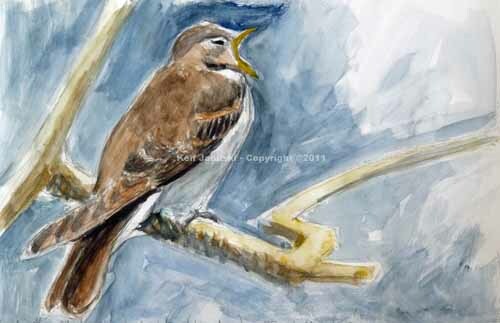 So inadvertently my last two watercolor sketches have been of birds with open mouths. There's no secret meaning here, just a recording of an odd natural coincidence. But it is a happy one and indicative of why I never get bored on my walks or in my art.